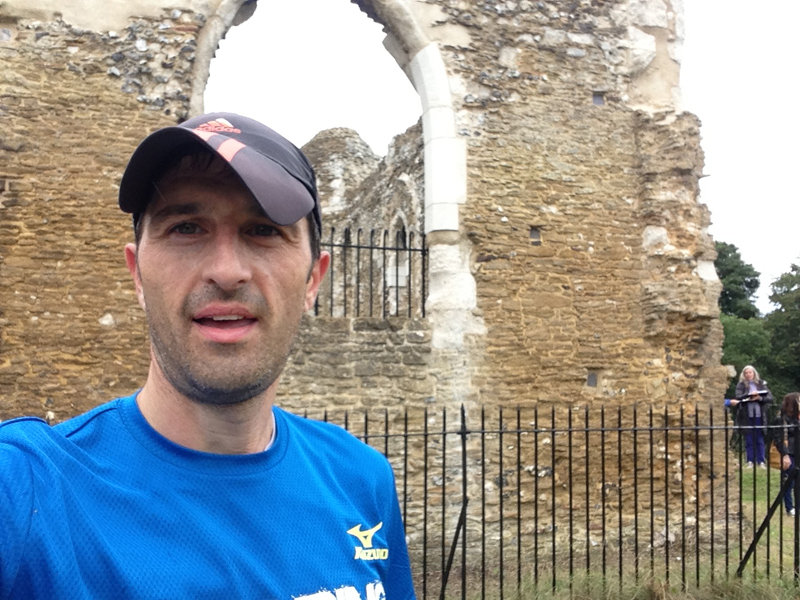 I took part in the Farnham Pilgrim Marathon as my final long run before flying out to Greece in just over a week for the Spartathlon event. The aim here was to bank a last long run so I could then justifiably relax and taper for the last week or two. The plan was to have a steady run but not exert oneself too much this close to a major event. 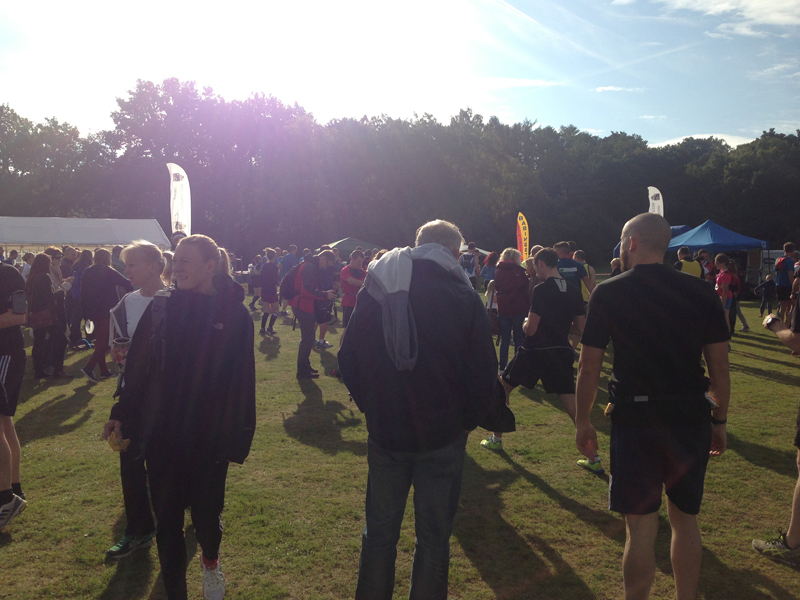 The Farnham Pilgrim Marathon is a predominantly off road trail marathon which can be described as fairly undulating with a couple of hills particularly at the half-way point. I travelled down in the morning and caught up with Paul Navasey, Edwina Sutton, Tim Adams and Dennis Cartwright and also bumped into Fiona McNellis prior to the race. The weather was pretty good at this stage although it was supposed to turn to rain later in the day. Runners ready for the start. I set out near the back at a steady pace and started clocking 8-9m/m for the first half of the race. I ran with Guy Mawson earlier on but moved ahead as he wanted to keep a really steady pace as he also had half an eye on an upcoming epic ultra “The Bear” (a 100 mile mountainous Ultra in Utah, US) in a couple of weeks. I ran by myself for most of the first half but caught up with Ultra Tales contributor Rob Jones who I hadn’t spoken to before and it was good to say a brief hello during the race. I got to the biggest hill at the half way point and ran up the majority of this half thinking my routine of easy hill reps was helping here. The hill then turned into a steeper climb with a sandy area and I felt as if I was giving too much effort here and have to admit to hiking up this bit (saving myself for Sparta was the excuse!). Following this bit, there was a downhill stretch and another short climb up to some ruins where I paused briefly for a quick photo (below). The pace slackened off into the second half of the race and I was running 9-9.30m/m for most of the second half. I pretty much plodded around the course stopping at most of the numerous (20) water stations for a drink and a snack before plodding on. The organisation and race markings were excellent. I’ve never seen so many marshals around and there was also some fun support from groups of young girls hiking who made an effort to “high-five” and cheer the oncoming runners. The only slight issue was that the route crossed a number of busy roads and runners had to take care when crossing. Having said that, the elevation of the route and some narrow trails in parts means this is certainly not a fast course and a few seconds at a crossing was no big deal. The weather had become more and more overcast during the race and it decided to rain towards the end but not too heavy. It didn’t worry me as I had half expected it as I was wearing my lucky hat. As I got to the 20 mile mark, I definitely decided to ease off further as the leg stiffness started to creep in a little. At the 22 mile point Tim Adams (another “Bear” entrant) came flying past me and I ran a few yards with him before deciding to carry on at my comfortable pace before I was sucked into a sharper run at the end which I hadn’t planned. The next couple of miles dragged a little but it felt like the second half of the route was more downhill than up which was a bonus and eventually I came to the aid station with 2.5 miles to go and got my head down and plodded on. There was a strange moment when a few of the marshals (I hope) had decided to dress up in Monks outfit to help give the Pilgrims Marathon its name. I passed a druid, an druid with an old lady face-mask (who seemed to jump out at you) and a wizard with a mask in a wooded area which was quite fun! With about a mile to go, I caught up with a runner who took a tumble right in front of me and I stopped briefly to check he was ok (he was) an I carried on until the turn up the hill marking the road to the finish. I ran up the last hill, turned left into the finishing field and then hammered it the last 50 yards to the line to see Kelvin Gower supporting at the finish. At least there was someone there to witness my heroic 50 yard dash for what it was worth (not much really). I finished in 3.55 which was around the time I expected. I would suggest you could add on around 10% to a normal marathon time for this course. I caught up with Paul Navasey, Edwina Sutton and Tim Adams at the end. Paul had won the race with an excellent time of 3.01 which was pretty impressive on that route and Edwina was 2nd Female with another excellent time of 3.19, well done guys. 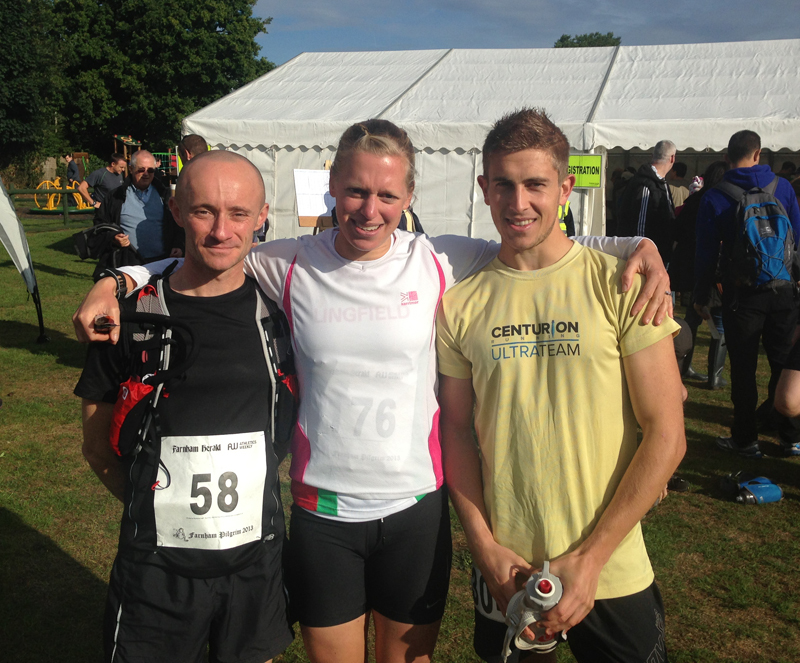 Scott, Edwina & Paul – great effort guys! I got changed and watched some of the finish and saw Guy Mawson finish around 4.25, he was a little unhappy with the effort but at least had banked another marathon and can now taper for his next Ultra. After a drive home and a soak in the bath, the legs have a little bit of stiffness but feel pretty good after running a marathon. It’s now enforced rest and taper before the big one..